Publication: December 31st 2013 by Harlequin MIRA. So sad that this is the end of the series. I really enjoy Maria Snyder’s books. Her books are full of wit and humor and adventure and this one is no exception. She really delivers. If you haven’t read the series, you should. 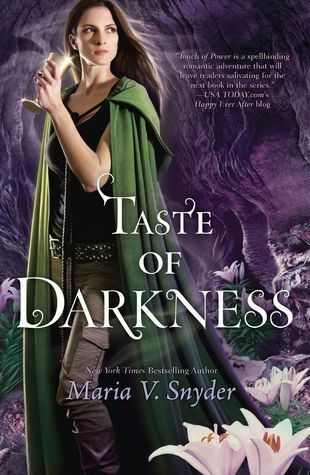 It is full of adventure, magic, humor, finding love, loss, and maybe ways to overcome death (read the books and you will see what I mean), political strategies, betrayal, some scary and powerful enemies, plants that connect with Avry or can kill, and some unwanted zombies. The series is about many kingdoms with magicians who are trying to take control and become one ruler of many kingdoms. Avry, Kerrick, Flea, Odd, and the monkeys and more are the good guys trying to set things right. Sometimes that means betraying the one they stand behind to fix a wrong. Sometimes it means losing someone. Sometimes it brings great sadness and sometimes great happiness. All the characters have grown so much. Especially Flea, he learns to accept what is given him after much turmoil. I love to watch that happen. This book took me a while to read. There is a lot of strategy and secrets and shockers in this book. So it is intense at times and you have to read carefully so you can keep up with all that goes on. There are a lot of sad times and lots of happy ones too. It was really an amazing adventure that I loved! Anyway, that is my ramblings on it.